Editor’s note: In Salih Seçkin Sevinç, creator of the fantastic Turkish-language food blog Harbi Yiyorum (roughly translated as “Eating, For Real” in English), we’ve found a kindred spirit and a source for great eating tips. We’ve asked Salih to share with our readers some of his culinary wisdom this week. This is his second post about the mind-blowing food scene in Southeast Turkey’s Gaziantep. If you ask for directions to Ciğerci Mustafa in Antep, everyone will show you where it is (right inside of the city’s bazaar). And what makes Ciğerci Mustafa such a destination is the current conductor of this place: Asef. He is such an interesting and colorful person that if you stretch your imagination a little bit you will probably say, “This guy is Şems-i Tebrizi or something.” He never holds his tongue, saying whatever comes to his mind. His heart and brain work simultaneously. When we first stepped into his place to eat liver kebab, the first thing we asked him was, “What are the traditions of this place?” As you can see, we were getting used to being in Antep, understanding that here one asks about tradition first. His eyes shined like crazy and started to tell us his secrets for how to eat liver, Antep-style. We did exactly as he said and returned at the appointed time the next morning. We had our liver kebab for breakfast and this time put lemon on it without asking. Asef saw this and he erupted with an “Aferiyyyynnnn! !” (“Well Done!”) Busy with kebab-making, he invited us to meet up later for an Antebian evening talk under a large tree that grows in the shade of the city’s old citadel. That evening’s talk under the tree is something that we will never forget. Here is a very special tip from that evening. 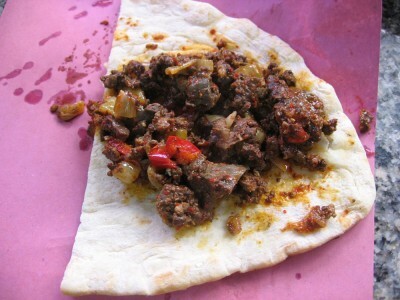 This is what Asef advised: “The truth about liver kebab? It must be made from male liver. Female liver is not tasty. I say to the butcher, ‘Does the liver cost 9 TL for a kilogram? Here is 9.50 TL. Give me a liver from a male.’” This, it turns out, is the secret of Ciğerci Mustafa. Asef learned his trade from his master, Mustafa, and maintains his respect for him. When Mustafa saw that Asef was ready to be a usta (master) himself, he quit working in the restaurant, saying: “There shouldn’t be two acrobats on one rope.” Now Asef runs the restaurant and keeps the tradition of this delicious liver alive. When you find the restaurant, you will spot Asef very quickly. Try to talk with him. Listen to his stories and to what he has to say. If he asks you out for a drink under that tree, you will know that he liked you. Please try Ciger also in Kosk Ciger Salonu in Gaziantep.